Labels. I hate ’em! They are so limiting. The smart one. The athletic one. The workaholic. The baby of the family. Breakfast. Lunch. Dinner. Huh?? That’s right. I hate labeling meals. Boring! And limiting! Breakfast does not have to be oatmeal. eggs, toast, bagel, or cold cereal. We can eat those things any time of the day. And if it’s last night’s leftovers for breakfast who cares? There is nothing wrong with chicken, rice, and broccoli for breakfast. If that is what sounds good, go for it. And sandwiches aren’t just for lunch! They can be fabulous any time of day or night. Likewise for dinner. Sometimes a bowl of cereal is perfect for dinner. Sometimes eggs and toast work. My youngest son’s favorite dinner is breakfast! For many years his special birthday dinner request was breakfast, or what we would “traditionally” consider breakfast food. So I fried up some bacon in my beloved old cast iron skillet. 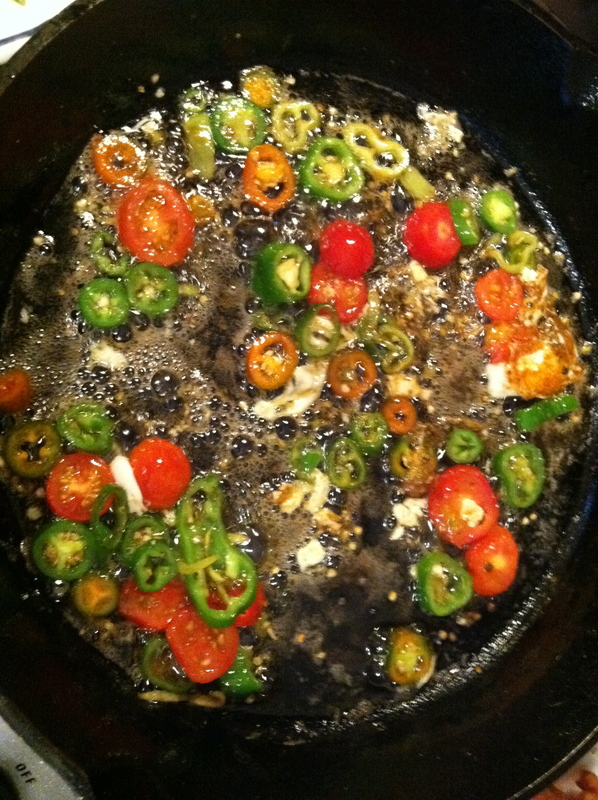 While the bacon was crisping, I started cutting up the peppers and tomatoes. 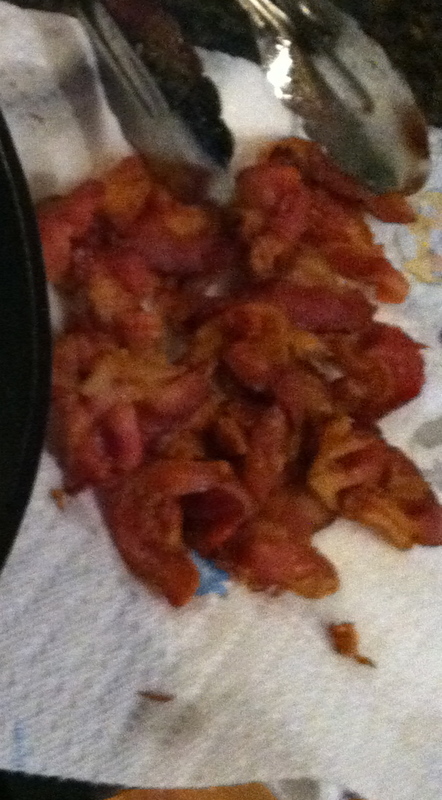 Then I scooped out the bacon, let it drain a bit, and left most of the grease in my skillet. The smells in my kitchen started deepening, layering. Man, was I hungry now! 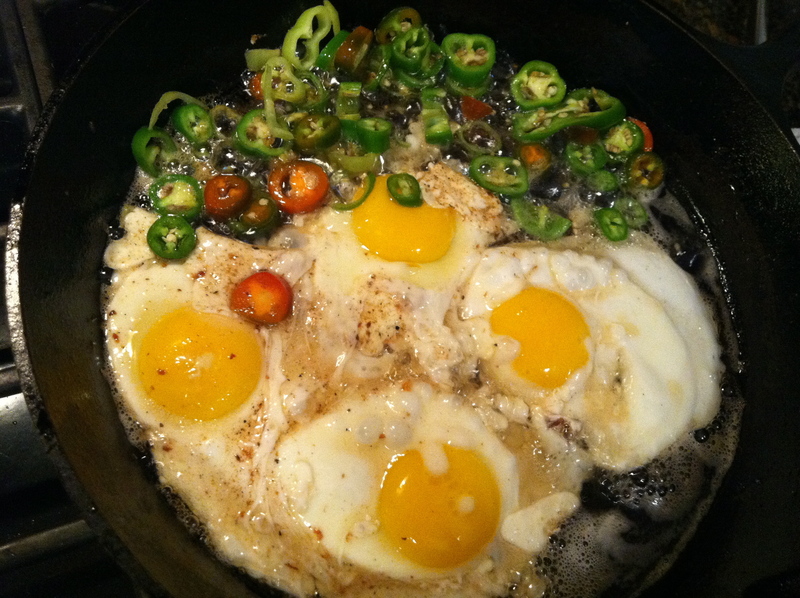 Peppers to the side...eggs in front! I pushed the veggies aside and tossed in eggs. Frying eggs in bacon fat. Yup…I warned you! Totally obscene! And completely delish! But my conscience would not allow this dish to be totally devoid of some sort of nutrition. So I made some whole grain toast. No butter. 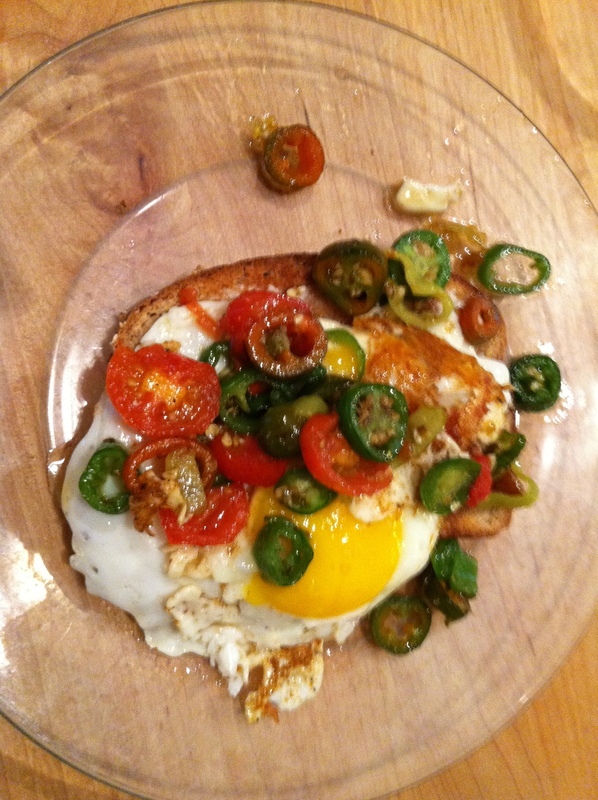 And tossed eggs, peppers and tomatoes on the toast. Fabulous! I love this quote. It applies to life in general. I guess the challenge is actually embracing, and not cursing, the detours, as we may want to initially do. But some road blocks, or detours, can have a great outcome! It’s all in how you look at it. I have had many detours when cooking, throwing dinner parties, and meal planning. I remember one dinner party that I was throwing on my new screened porch to celebrate its completion. I worked for weeks on my guest list, menu, and decor. A short time before guests were due to arrive, the lovely early summer weather turned blustery and rainy. I had to quickly move my dinner party inside. I was scrambling with this last minute change of plans. Plus I had to deal with the disappointment that my perfectly planned dinner party was not going to be, well, perfect. I could not have been more wrong. It’s a beautiful thing when all of the dishes line up, the flavors are in harmony, and the food is presented beautifully. The stars were lined up that night, because it all just worked. I embraced the detour and all went well. The company at that particular party had an amazing dynamic too, so no one seemed to notice the change in venue. It was a great night, and that dinner party has become one of my most favorite memories. When I was in college, I had my life planned out. I was a very ambitious 20 year old, with aspirations to travel the world, experience exotic food, and write about it from my home base of New York City. International friends. Amazing parties. Glamour! I ended up landing in my hometown, married, and then had children. Motherhood was not really something that I had considered, and it was not in my plan. But I embraced the detour. This detour into motherhood has truly been my best detour ever! At first it scared the heck out of me. I’m not gonna lie. Becoming a parent is a humongous deal, and creating a family is monumental. Quite frankly, I was a little too chicken to tackle that, or so I thought. Becoming a mother has brought more joy, love, beauty and warmth to my life than I ever could have imagined. There is a mathematical exponent involved in having children in which happiness is multiplied. I marvel every day at how embracing this detour from my immature 20 year old perspective has made me happier than I ever thought possible. I am eternally grateful for the joy that this detour has given me! Clearly I have had many detours in life. I made a decision as my first child entered high school to tackle an educational goal. I wanted to complete my Masters. That was a very lofty goal for me, very challenging. A detour into student mode was a huge change. Oh, and did I mention that I wanted to complete it by the time he began college? So I dove in. Well the detours (or should I say road blocks…) began frustrating me. With family and professional obligations I was not able to go as quickly through my classes as I wanted. But then I noticed something. I was so focused on the outcome that I really wasn’t enjoying the ride. I just wanted to finish. But when I embraced my life as it was, and slowed my classes down, I began to realize that I started to enjoy the journey and the “road blocks”, or should I say detours, didn’t bother me anymore. And I began enjoying the people in the classes, the learning, and the experience more. I am sending my oldest off to college next month…and still taking classes. But the detours have been terrific! I am now embracing them. Sometimes the negative thoughts win out. Let’s just admit that. Some days feel like roadblock after roadblock. And that can wear a person out! But with these 3 simple little words, roadblocks can become detours, a change that can become empowering! Embrace the detours! Ok. We all have them tucked away into our memory. If you have forgotten, I guarantee that some one else remembers! You know what I am talking about. A flop. That is when a recipe, dish, or meal just does not come together as it should. And it always happens at a significant time. Company. Holidays. A special occasion. Instead of a bang up dish, a flop is gracing the table. Phooey! My children spent a week at camp earlier this summer. While my house stayed clean, organized, and dirty laundry free for several days, I sure missed them! They were due home Saturday. So I spent Friday evening toiling away in the kitchen. I made sure that my children were not only returning to a favorite meal when they got home, but a comforting home-made dessert as well. So I made a big batch of vodka creme sauce and penne pasta. A savory vegetable casserole. Garlic bread with italian seasoning and freshly grated parmesan cheese bubbling on top. And, of course, a very special dessert. A chocolate fudge (loaded with chocolate chunks) double layer cake. While I am most definitely a much better cook than baker, I am known around these parts for making amazing frosting. Butter cream frosting. Beautiful and fluffy. Even my mom commented that my frosting is better than hers (major score!! If she just could have said that in front of my sister…). So I admit that I now take great pride in my frosting. This cake deserved my best frosting ever. It was the cake to welcome my children home from a week of camp and a week away from mom’s cooking. A special occasion-a celebration for sure! Yes! You guessed it. It flopped. Not the dinner. And not the cake either. 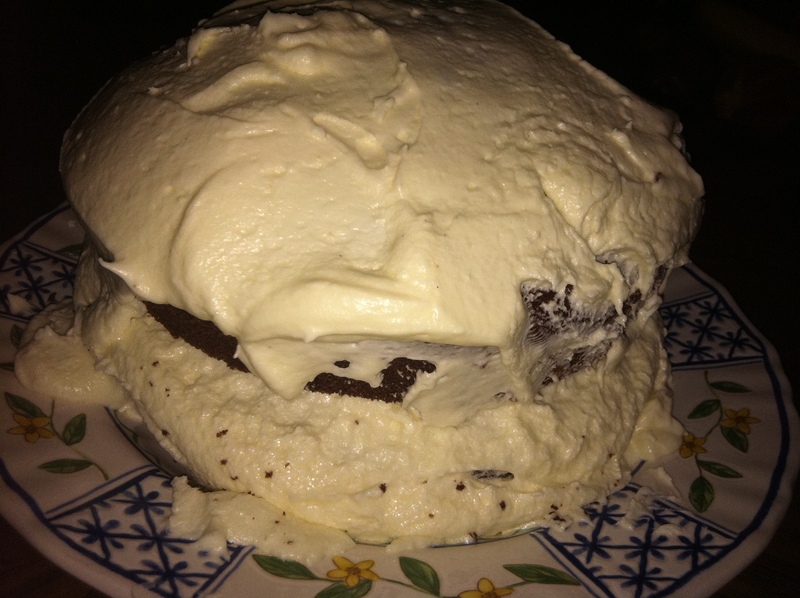 My soon-to-be-famous butter cream frosting totally flopped. Disaster and embarrassment! How could this have happened? But secretly I knew what I had done wrong. See, even when you try to substitute an ingredient that you know is inferior, even when you do it while talking to yourself (and talking to the ingredient) and willing the substitution to work, sometimes it just doesn’t. But in a rush, we make mistakes and things flop. My butter cream frosting is made with Crisco solid shortening. Pure fat. So tasty! As I measured the Crisco, I realized that I was just a smidge short. I went to the fridge, grabbed the tub of margarine, and tossed some of that in to my frosting. Well that margarine had a high water content, so the frosting would not hold. It dripped. Oozed. Slid. It had no body. The children came home. I showering them with kisses, dragged camp trunks to the laundry room to start unloading clothing laden with that unique (gag me!) camp scent, and giggled at their camp stories. After a bit, I was ready to proudly tell them about the special dinner that awaited them, and the very special dessert that I had labored over. Dinner was a hit! Then it happened. My kids saw that cake, the top layer sliding off the bottom layer and frosting leaking out of the middle, and looked at me for a bit of a barometer. They had to get a good read on me. I threw my head back and belted out a huge loud laugh, and they quickly followed suit. That frosting in no way resembled my typical white fluffy butter cream frosting. But man, it sure tasted good! This cake was a scream! Hahahahahahahahahaha!! Whats next after a flop? A good belly laugh of course! You just have to laugh it off. That’s what I do. You have to let the little stuff roll off your back! And be sure to share that laugh with someone else. Like I said, don’t bother to remember it. Because when you forget, someone else will be only to happy to remind you of your flop! Our skeleton is composed primarily of our bones. Some of us have never broken a bone, some of us weren’t that lucky. As kids, our parents drilled the importance of dietary calcium into us. Who didn’t hear “drink your milk so you can have strong bones!”? Calcium. Fact or fiction? Do we continue to need calcium for bone health as we age? Is calcium just for kids? The short answer is yes, calcium is important for bone health. Especially when we are young. Calcium builds our bones and is very important in the diet, especially in childhood. Up until our teenage years is the best opportunity to build our bone density, and bone density is a good thing. We want solid bones. It is important to really encourage calcium intake in children. Most americans fall short of where their calcium intake should be, so we really need to focus on it. Where is calcium? There are many places to find it. And there are plenty of foods fortified with calcium too, like breakfast cereals, and supplements. Calcium is recognized as so important, in fact, that many foods are now fortified with it. Fortification is adding micronutrients into a food that is not naturally found in that food. Just look in the fresh juice aisle at the grocers and you will see calcium and vitamin D in orange juice. That is fortification, and fortified foods are a good source of calcium as well. It is in bread, cereal, tofu, many foods. It is a perfectly safe and acceptable way to boost calcium intake. But is calcium important after our teenage years when we are no longer building our bones? Yes, it’s important throughout our entire life. Calcium, phosphate and vitamin D are all important throughout our life for good bone health. We think of bones as something solid and strong, but bones are actually made of tissue. And this tissue has constant turnover. Bones rebuild themselves. So it is important to continue with our calcium! Really, any activity will be beneficial to bone health. Even going out, grabbing the jump rope and jumping with your kids is good for your health! So grab a glass of milk (skim milk and 1% has just as much calcium as whole, so choose skim and leave the fat behind!) and go for a good brisk walk. Take care of those bones! I am a true foodie. I like to talk about food, look at food, and share food. I take pictures of food I make. I take pictures of food I eat out. I brag about food, whether I eat it out or make it. If I have a fabulous meal, I talk about it. I think about food combinations. I look for food inspiration in colors, farmers markets, menus, cocktail conversations, supermarket shelves…so basically everywhere. That’s a foodie. And we like to hang out with other foodies that are as intellectual and sophisticated (uummm dorky!) as we are. I also love nutrition and wellness. Good nutrition is an important value in my life. I like to cook from scratch with fresh wholesome ingredients. I have been raising my children with this philosophy too. They are not, even as they have grown into teenagers, big fans of fast food. If they do, on occasion, eat fast food, they come home and ask that their next meal be, in my daughters words, “healthy and good”. I am thankful for this. 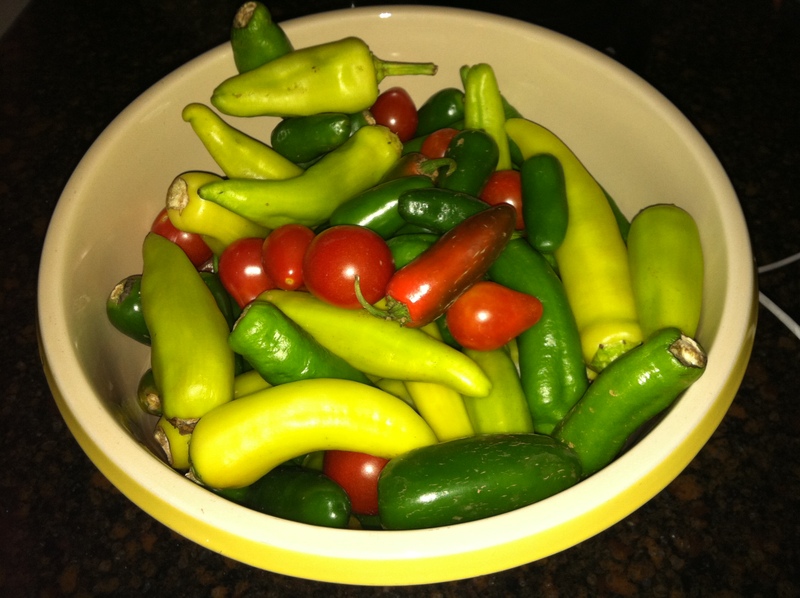 It is important to their overall well being that they not only like, but choose and eat natural whole foods. But every once in a while, we all get a little naughty! I had Fried Green Tomatoes for the first time a couple of years ago in Hilton Head, South Carolina. Then again in Charleston, South Carolina. I am not a big fan of fried food, but oh man, the Fried Green Tomatoes were delish! I recently had the opportunity to have them again and was with a dining companion that had never had Fried Green Tomatoes. Game on! Of course I ordered them to bring my companion to the naughty side! Luckily my friends are always ready to try new foods and get on board with fun fare when they are with me. Even if its a little naughty. The Tomatoes came to the table with a beautiful presentation. 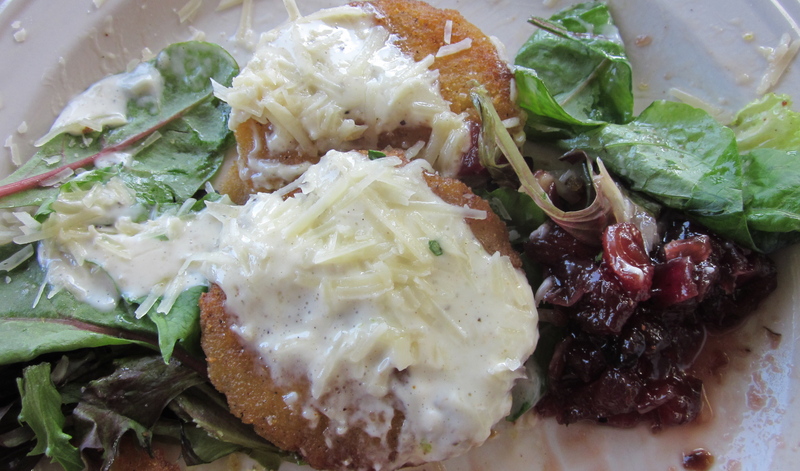 The Fried Green Tomatoes rested on a bed of lovely fresh mixed greens, and my favorite, arugula. The plate was drizzled with sauce and had a side of sweet smoky apple chutney. What an amazing pairing! The colors on the plate were appealing, and the taste matched the presentation…fantastic! The plate was pleasing to the eyes, the nose, and the palate. When that happens, the foodie in me emerges and I just gotta talk about it! The Fried Green Tomatoes were followed by the next course. It was a well prepared Monte Cristo sandwich. I have made Monte Cristo Sandwiches. When I have made them in the past, I have fried them. Whole. I served the sandwiches with a homemade raspberry relish for dipping. 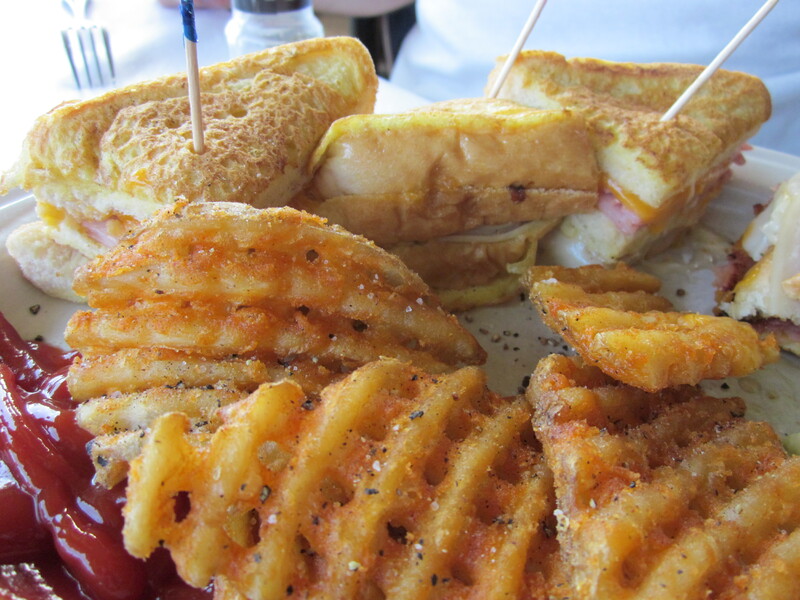 The Monte Cristo that was came with the Fried Green Tomatoes was a departure from those I had enjoyed in the past. The Monte Cristo sandwich pictures below was on a french toast style bread and served with maple syrup for dipping. I admit, when this came to the table, I was a skeptic. But this time it was my companion that expanded MY palate. The combination was amazing. And it was a combination that I would not have thought of, which is why I appreciated it so much. As I said, I value good nutrition. I value my good health. I value fresh wholesome food. Once in a while, though, I depart from this. After all, in moderation, most everything can be good. Even if it is comfort food that is good for the soul but maybe not the arteries! But sometimes being naughty is nice! !